It has been known for a long time the important health benefits of exercise. However, what has more recently been found is the danger of prolonged sitting. What is somewhat surprising is that even if you exercise, prolonged sitting can still increase your risk for many diseases. More and more people in developed nations are spending more time sitting. With the rise of jobs that depend on computers and more time spent in a car, people are spending most of the day planted on a chair in front of a screen or in transportation. In fact, the average adult spends about half their time sitting. If you find yourself sitting most of the day, here are some practical tips for combating the harmful effects of sitting. Researchers are still understanding why the risks of sitting are so impactful. However, one reason why being sedentary is more harmful is because of the way your body metabolizes energy while sitting. The body handles sugar and fat differently at rest than while moving. Over time, prolonged sitting can mean the digested food energy can increase risk for type 2 diabetes or cardiovascular disease because muscles are not engaged to utilize the energy. The energy is more likely to go to fat storage and may interfere with insulin signaling. A 2015 review article looked at data from over 45 studies that compared sedentary time for adults and took into account exercise. Researchers concluded after looking at these studies that prolonged sitting was independently associated with negative health outcomes, such as premature death, regardless of physical activity. Put simply, the researchers concluded the more time people spend sitting, the higher the risk for premature death, heart disease and diabetes even if they spend time exercising. The researchers found that exercise of about 60 minutes per day did not significantly outweigh the negative effects of prolonged sitting. If people do not exercise, risk from prolonged sedentary behavior can definitely be increased. Some of the harmful effects from sedentary behavior can include increased risk of premature death, heart disease, some cancers, type 2 diabetes and possibly even dementia. If you only sit 3-4 hours a day, is that considered ok compared to sitting 6-7 hours? What is the cut off point for sitting an increased risk? At this point there really isn’t a clear cut threshold for sitting; a general guideline is just the less the better. It is also important to break up sitting with movement breaks. This may help lower risk seen with prolonged sedentary behavior. Also, keep in mind just because you exercise for 30-60 minutes a day, it doesn’t mean you don’t need to think about moving more through the day. The 2015 study suggested exercise of about an hour a day did not significantly offset the negative effects associated with prolonged sitting. Everyone can benefit by breaking up prolonged periods of sitting. Start by trying to cut down on the amount of time you spend sitting. Even cutting down your amount of time sitting by a couple of hours per day can help. For example, maybe you can cut down on the amount of time you sit in the car or public transit. Instead of watching tv or being on the computer in your leisure time, go for walks, ride your bike, garden, etc. If you do have a sedentary job and find yourself sitting most of the day, there are things you can do to lower your risk associated with sitting. 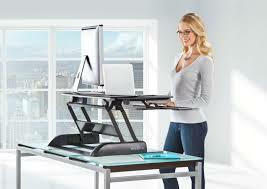 Standing desks are getting popular, as research suggests standing does burn more calories than sitting. Talk with your supervisor to see if changing your office space can be an option, and it could benefit others as well. Taking breaks from sitting is an easy solution. Taking a break every 30 minutes is ideal, even if it’s just for a few minutes. Get up, walk around, climb some steps, do some stretches, etc. then go back to your desk. It may seem impractical, but it could be beneficial in the long run. There are now even applications for smart phones that remind you to get up and move around. Encourage your co-workers to move with you! Prolonged periods of sitting can increase risk for premature death, cardiovascular disease, type 2 diabetes, some types of cancer and possibly even dementia. As technology advances, more and more jobs are dependent on sitting in front of a computer which puts many people in positions of long periods of sitting without much movement. Even when people exercised, sitting for long periods of time can still increase risk for chronic diseases. To combat this, taking breaks throughout the work day for movement can help. 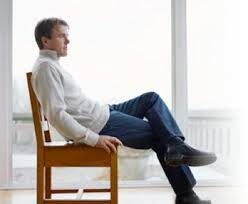 Finding ways in your leisure time that don’t include sitting can also lower the amount of time being sedentary.